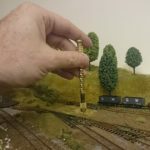 N gauge locos are tiny. 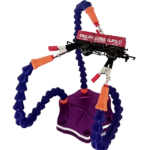 And when they break all those small parts can seem a nightmare. But it’s really not that hard once you know how. Here’s how I recently fixed and serviced a Graham Farish tank engine. With a few minutes to spare last night I adjourned to the loft for some track laying. 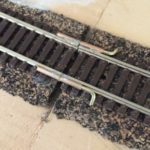 The section I’m laying at the moment has two runs of code 55 flexi-track winding their way up a steep incline and I was eager to get these in place. 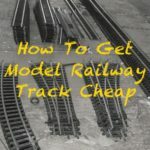 Having set the track and fixed it down (see 3 quick track laying tips) I connected the power and took a couple of engines for a spin to check they could manage the incline. This is always the fun part and it was a delight to watch the micro machines trundling up and down. 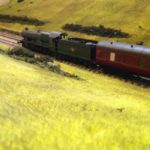 It was all going well until, having successfully pulled a rake of wagons up, I flicked the switch to bring my favourite tank engine – an old Graham Farish GWR 8750 Pannier Tank 4612 – back down the hill. > Note: This article covers repairing and servicing an old Graham Farish N gauge tank engine. 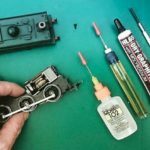 While the disassembly instructions vary the techniques and materials mentioned for servicing it will work just as well for more recent models, other brands (Hornby etc) and other gauge locomotives. It made its way down the slope and then stopped. I won’t bore you with the details but subsequent testing revealed it wasn’t the track, controller or electrical connections. My pannier was kaput! Nothing in forward or reverse. Not even a gentle hum. Zilch. I wasn’t planning on wearing my model railway doctor hat that evening but my favourite engine was dead and I wasn’t going to leave in her in the moment of need! It was off to Swindon works, the other side of the loft, and my toolbox for 4612. Is it me or do the insides look like something from Wacky Races? Getting inside of the locomotive was a simple matter of removing a single large screw on the underside, towards the front. With this safely put to one side, it was then a case of very gently levering the wheel and engine assembly out of bodyshell. On some trains, there are clips from the frame into the bodyshell. These need identifying and the frame sliding out so as not to snap them off. On this model however it was just a case of easing the assembly out. With the internals revealed, a quick examination showed no obvious contenders for the cause of my problems. Given the lack of power, I was expecting a wire had worked loose but the connections from the pickups to the motor were firmly in place. Another contender was the previously mentioned pickups. These are thin strips of copper that brush against the insides of the wheels. When the wheels touch the track with the power applied electricity flows through the wheels to this pick up. A screw conducts electricity from the pickups to the aforementioned wire on the top of the motor block and to the motor. A worm drive from the motor turns a cog, which, in turn, drives another cog on the axle making the wheels turn. Over time dirt can build up on the surface of the pickup and prevent electricity passing. This can cause problems but given the complete lack of power I doubted this would be the cause. For good measure, however, I slid the blade of a watchmakers screwdriver between the wheels and pickup to remove any debris and dirt and followed this up with a wipe of my favourite railway cleaner – Goo Gone (available from Amazon) – to remove remaining grime. 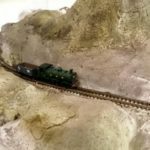 Placing the loco on a test track showed no improvement. Not unexpected but disappointing. In bits, here you can see the pickups and the cog on the drive axle (being held). Both need servicing to keep your locos running smoothly. Next up came the cogs connecting the motor worm shaft to the drive wheels and to check the motor. Getting at these cogs required removing the gear and axle cover. On this model, another recessed Philips screw is removed. With this gone the cover can be lifted free to reveal the wheel axles, including the central one featuring a cog which slots into another cog driven by the motor. Over time and with wear, the teeth of these cogs can sometimes break or the root of the cog split (the well-known split gears). If this was the case I’d expect the motor to still turn but be nosey and less responsive. As this wasn’t happening I didn’t think it would be a broken tooth but it’s good to check and apply some grease. 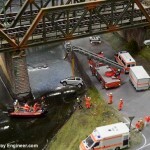 (see my guide to which oil and grease are safe to use with model trains). This done I slipped the wheels back I to place, replaced the axle cover and pushed the pickup straps home with my fingertips and placed on my test circuit. I was now considering if the motor itself might have broken. I had a spare, acquired at some point from eBay or was it BR Lines?, but this was destined for another use and to be honest, the motor unit is the hardest part to remove. It’s surrounded by metal and isn’t easy to extract. It was while considering options that I had a poke at the wiring. Actually, I was trying to move it aide to see if there was room for a DCC upgrade but that’s a different story for the future. Anyway, fortune smiled on me and 4612 and while examining the wire I noticed blackening on the underside. I’d already checked the joint where the wire connects to the armature unit but could the wire itself have become damaged? I gently removed it and replaced it with a new strip of wire and applied power to the pickups. The motor whizzed away. Success! All that remained was to put the pannier back together which took a surprisingly long time. In replacing the wire I dislodged the plastic sheath leaving the meal strand core exposed. The exposed section then touched the inside of the bodywork causing a short. Annoyingly I didn’t spot this until I’d put it all back together and so had to disassemble it all and try again. After a couple of further failed attempts when the engine block wouldn’t sit correctly in the bodyshell I finally had my wonderful little pannier engine back in once piece and whizzing around the track again. It even climbed the new incline better than before so my evening wasn’t wasted. Interested to read this. I have exactly the same engine. It hasn’t been used for a long time. This evening I put it on track. It moved hesitantly a few inches and then stopped. Continuing to apply power brought a whizzing sound from the engine. The electric motor is fine but something has broken with the drive system. This page has encouraged me to open the engine to try to investigate. Hi I have a Graham Farish n gauge Tornado. It appears to have one of its piston linkages missing and a link arm is just hanging. Can you repair it. I have a cpulr of locos that need to be converted to DCC.